Touchstone companion book for anyone implementing Ubuntu LTS Server. Administer, install, and configure the 5–year Hardy–Heron Ubuntu Server Long Term Support Edition of the most popular Linux distribution in the world. Use the new installation and graphical user interface tools. Familiarize yourself, whether you are a power user or system administrator. Build a network infrastructure with Ubuntu Server. Harden Ubuntu to withstand new security threats. 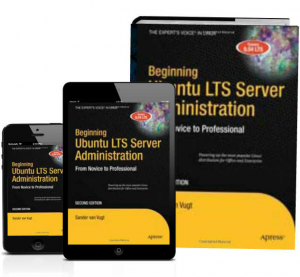 This book Beginning Ubuntu LTS Server Administration will suit Linux system administrators of all levels. It also lets power users who want to familiarize themselves with network and web services relevant to their work acquire up–to–date specialized Ubuntu skills.